I feel like this gradient is one of the best ones I've ever done - and it's all thanks to the fact that I've been practicing - a LOT. You really can't get better just by watching videos - just use a clean makeup sponge, and practice - you'll have pretty gradients too! Why I only did 3 bottle shots of this gradient is beyond me but I really like this pic! 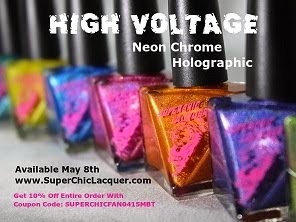 I'm a holo-addict - it's quite true. Can you see the glitters? Hopefully! Yes, these took a little while, not too long, but long enough for me to line up the glitters all nice like. I usually use a toothpick but I realized that you can get a pretty nice point on a wax pencil and that works super well for picking up the glitters. I bought mine on ebay somewhere - you can get them anywhere that sells artsy things :) Super helpful if you like doing GP like I do.